If you're anything like me, you might find yourself apologizing for everything, even when it's not your fault. While often portrayed as a female issue, the tendency to put yourself down or unnecessarily assume blame isn't relegated to women; the Independent's blog indy100, for example, points out "there are 15 British apologies for every 10 American ones." Chinese artist Yao Xiao (who is currently based in Queens, New York) thinks you shouldn't apologize just for existing or needing something. These things aren't wrong, so they shouldn't be treated like they are. 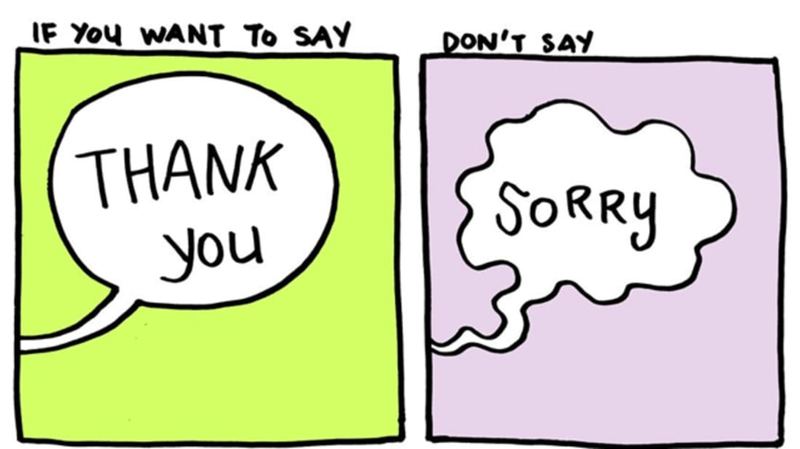 In a series of poignant cartoons, Xiao shows how the best replacement for "sorry" might be "thank you." "Apologizing for being present/being vulnerable and open was something I used to do," Xiao told indy100. "Acknowledging that you appreciate someone who cared for you is a very nice thing to do and makes both parties feel great." The helpful comics are part of an ongoing series called Baopu. Although deeply personal to the author, most people find the comics to be wholly relatable. When not working on life-changing comics, Xiao also illustrates book covers, album art, beautiful graphic designs, and even the artwork for Katy Perry's single, "Dark Horse." You can see more of her work on her website, or follow her on Twitter and Instagram. Images courtesy of Yao Xiao.